The big news for markets this week was the rebound in global indexes, following the precipitous drop that followed the Brexit vote last week. The electorate in the United Kingdom have voted to leave the European Union. There had been a total loss of $3 trillion USD (United States Dollar) in world equities as a result of Brexit earlier this week. The American Dow Jones Industrial Average after losing close to 900 points in two days has now pulled nearly even, to where it was last week at around 18,000. The movement was the largest stock rally since February. At the beginning of the week, European leaders gathered to deal with the aftermath of the Brexit vote. The consensus is to have the United Kingdom act decisively, to resolve economic and political uncertainty. 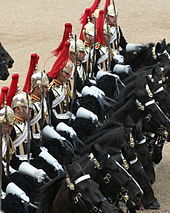 Although the British government seems to be in no hurry to move forward on separation. The United States ten year government bond yield dropped another 11 basis points to a decade low of 1.378% earlier this morning. 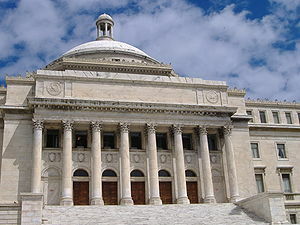 The Capitol of Puerto Rico, home of the Legislative Assembly in Puerto Rico. In the American territory of Puerto Rico, the island commonwealth defaults on $1.9 billion USD in debt payments. This was in conjunction with new legislation that will permit a restructuring of debt, and will put Puerto Rican finances under federal oversight. The territory owes at least $70 billion USD to creditors. The United Kingdom ten year government bond, has dropped another six basis points to a new historic low of 0.81%. This was the result of the Bank of England stating that there could be a further reduction in interest rates, if there is an economic need. Yields on short term government bonds also, fell into negative territory for the first time. In addition, British pound sterling dropped to its lowest valuation in 30 years. The United Kingdom had its sovereign credit rating downgraded from AAA, as a result of the Brexit vote. Also in the United Kingdom, Boris Johnson the former mayor of London was seen as a strong contender to replace outgoing Tory Prime Minister David Cameron. The former has taken himself out of contention for the position this week. The next most likely candidate is Theresa May. In Scotland First Minister Nicola Sturgeon has started legislation, on a new referendum for independence from the United Kingdom in the face of the Brexit vote. The last one was held in 2014, but the majority of Scottish voters do not wish to leave the European Union. The presidential election held in Austria this past May, has been overturned and must be held again. Former Green Party candidate and now independent Alexander Van der Bellen, had narrowly defeated far right candidate Norbert Hofer. The decision made by the constitutional court, is the result of voting counting irregularities. In Spain, another round of elections failed to break the electoral impasse that began last December. Prime Minister Rajoy’s conservative People’s Party did gain additional seats, but is still far from a majority. There will now be additional attempts to form a new coalition and more political stalemate. 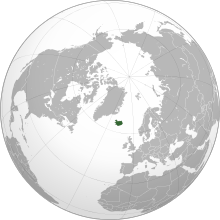 Location of Iceland on a global map. In Iceland, history professor Gudni Johannesson became the first new president in 20 years, as a result of an anti-establishment vote. In Turkey, three suicide bombers killed 40 people and wounded 150 others at the main international airport in Istanbul. The facility is the 3rd largest in Europe and serves 60 million passengers a year. Turkey has recently repaired diplomatic relations with Israel and is now moving forward with overcoming disputes with Russia. The country is facing a rising threat from terrorist activity. Manufacturing in the Euro-zone grew faster than estimated last month. The June performance is the best for 2016. However, the effects of Brexit have yet to be felt in the sector. The Euro-zone saw the return of inflation after four months of falling and stagnant consumer prices. This was the result of a stabilization in energy prices. Japan witnessed the fourth straight month of a decline in manufacturing. Meanwhile the public pension plan known to be the largest in the world at $1.4 trillion USD, registered a loss of more than $50 billion USD in 2015. This was a result of a fall in domestic stocks and a surge in the value of the yen, in the face of global market turmoil. In Argentina, the new government of Mauricio Macri has revised economic growth for the past decade. GDP (Gross Domestic Product) declined an additional 0.07% in the first part of 2016. 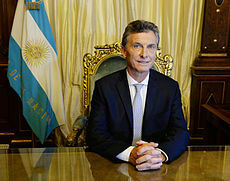 It is the third quarter of contraction, indicating that the President Macri inherited an economy already in recession. However, the new government transparency and opening up of the economy is attracting far more foreign investment. This will assist in creating future growth. Gold is still moving higher today with an additional +0.97% , reaching a 2 year high of $1,342.30 an ounce. The big mover though is silver. An additional +3.66% Friday morning at $19.48, after reaching a high of $19.53. Crude oil has experienced the highest quarterly advance since 2009, rising 30% in 3 months. Investors have calculated that the falling output in the United States, will balance out the global oversupply. Supply disruptions in Canada, Nigeria and possibly Norway have helped propel prices higher. However except for Nigeria, these are temporary interruptions. Therefore further price advances will be difficult at this time. On Friday morning, American West Texas Intermediate (WTI) oil increased +0.60% to $48.62 USD. Prices are still $0.84 USD higher where they stood from last week. International priced Brent is down by -1.84% at $48.51 USD. This is a $1.17 USD increase in valuation from the week before. The Investment Newsletter had 2 target fills to report this week, and 0 early stock target fills.